In a recent Toronto Postcard Club auction, I took a flier on the intriguing but mysterious railway postcard that you see below. A real photo postcard (RPPC), it was mailed on 8 April 1911 from Chatham, Ontario to Pontiac, Michigan. That’s maybe 75 miles as the crow flies, but any crow making that trip would not have looked down on a landscape anything like the wild country depicted on the postcard. Nor did the sender’s message offer up any clues as to the location of the image. To figure out what I was seeing, I had to turn to the barely legible caption. With a bit of squinting, all but the third of the five words were pretty easy to make out: BALLAST TRAIN, B——— RIVER TRESTLE. After a while, and with the help of my magnifying glass, I decided that the missing word was almost certainly “BARRINGTON”. 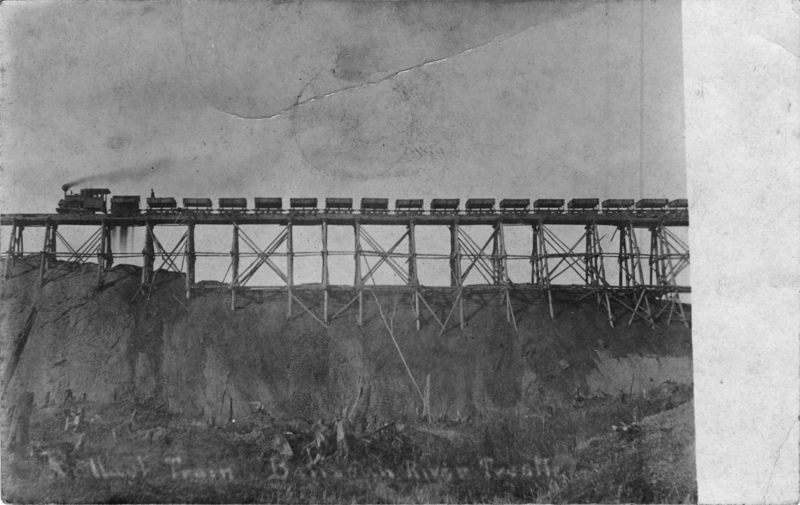 So there we have it: “Ballast Train, Barrington River Trestle”. Knowing the whole caption should make it easy, then! Except it didn’t. Repeated online searches turned up little more than a truss bridge on the Barrington River in New South Wales, Australia. That could in theory be the right general area, but a truss is not a trestle and the part of the river valley around this truss bridge, at least, doesn’t really resemble the landscape of the postcard. Aside from that one faint hope, initial online searched yielded up next to nothing. But at least my search gave me a “Barrington River” to think about, in addition to two others that are also famous enough to have entries in Wikipedia — rivers in Rhode Island and Nova Scotia. Surmising that Nova Scotia was a promising possibility, I took a look at its Barrington River, which discharges into the Atlantic right at the southeastern tip of the province (east of Yarmouth). There have been railways in the area, so it seemed possible that this trestle might have crossed the Barrington — but if it did, there is no sign of it today on Google Earth. What’s “Wrong” With This Picture? Tip for identifying your mystery image: look at it! At this point, I did the best thing I could have done — I asked the experts of the Nova Scotia Postcard Collectors Facebook group, who include several Toronto Postcard Club members. Before I come to what they told me, I would just say that one thing I had neglected to do was to actually look at my postcard. There are a lot of clues within the image, as became apparent when I looked at it as the image it is — rather than the image I assumed it to be. To back up a bit, I had assumed that the image was of the everyday train-going-over-bridge/trestle RPPC genre. Sure, it’s an undeniably odd-looking little train — its toy-like engine and long row of identical hopper cars bring to mind a fake backdrop from some spaghetti western — but it didn’t strike me as being all that different from other trestle postcards in my collection. Unlike other trestles, this one appears to have been built on top of a big mound of earth. The trestle looks very rickety. The train has no tender (coal car) and the locomotive doesn’t look very powerful for such a long train. There is a figure in the second car back from the engine, standing straight up, which is not advisable (and likely not physically possible) on trains speeding across trestles. Something strange seems to be going on in the car directly in front of the car with the man in it. The first thing that the Nova Scotia experts told me was that the locomotive is a very old wood-burner, as evidenced by the shape of the smokestack and the absence of a tender car. This particular type was in service from the 1880s until the 1920s, at latest, and was not very powerful. From that it seemed reasonable to conjecture that the train on the postcard was likely a working train for a construction or mining project that may have built its own private railway to move goods and product around. What the train was doing is actually fully illustrated in the image, if I had cared to look at it and use my little grey cells. To go through my points above, the reason that the man is able to stand straight up (4) is that the train isn’t moving. Why isn’t it moving? Well, because it’s already where it’s meant to be … on the job. But what job? Thanks again to my Nova Scotia colleagues, I learned that it was on the job of building a huge earthen embankment for this very railway. We can actually see this happening, as the first car behind the engine (5) is dumping its load of earth (the “ballast” of the caption) over the side of the trestle, where it is visibly falling into place underneath. The trestle hasn’t been constructed on top of the earthen embankment (1) — instead the earth has been painstakingly dumped around a trestle that was built from the ground up, in order to create an embankment. At the moment in time that my postcard has preserved, this process was about half complete. One reason for using the old locomotive (3) was probably that it didn’t weigh very much and was therefore safe for the trestle, which wasn’t really a permanent trestle at all but a sort of skeleton used in an ingenious method for building a very long and high earthen embankment. That’s one reason that searches for “Barrington River Trestle” turn up nothing — it was only a temporary structure and only those few who were present during the construction period ever laid eyes on it. Admittedly, none of this solves the mystery of where this was all happening. The Nova Scotians were pretty sure it wasn’t anywhere near them. So, on the assumption that this was most likely a Canadian scene, I took a deeper dive into Google and found that there is also a small Barrington River in northern British Columbia and that, moreover, that very area has been the site of gold mines, on and off (mostly off), for more than a century. While the few photographs of the area that Google grudgingly provided were no help with the “trestle”, this topographic map proved a lot more interesting. If you open it up and zoom in just a bit. you’ll see that just to the northeast of the river (answering point (6) above! ), in the broad valley through which it flows, there is an almost ramrod straight road named (tellingly) “Iron Road” and that there is a section of that road where the mapmaker shows it flanked by two thicker lines. My guess is that those lines represent the embankment whose construction is depicted in the postcard and that “Iron Road” is just the old rail bed from 110 years ago. The aerial image below shows the very same section of the Iron Road as a feature that stands out from the surrounding landscape. It looks like it could well be an embankment. Now, if we imagine a photographer standing on the hillside to the northeast of that spot about 108 years ago, looking back across the Iron Road (or railroad as it then was) toward the river, what he or she would have seen would have corresponded quite closely to our postcard image — particularly inasmuch as the card doesn’t seem to show any of the mountains that encircle most of the site. In this rugged area, only a photo looking southward toward the Chutine would be as devoid of mountains as the postcard image appears to be. 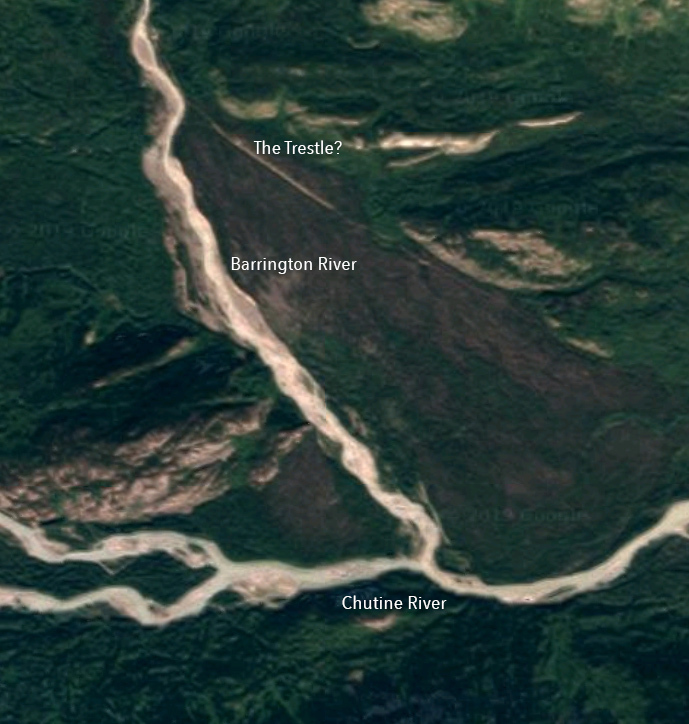 The Barrington River is a short tributary of the Chutine River. It is found in a remote and mountainous area of northwestern B.C., between the Alaskan boundary (to the west) and the small settlement of Telegraph Creek on the Stikine River (to the northeast). I’ll be the first to admit that my evidence is circumstantial. Perhaps my postcard is really from New South Wales or Rhode Island. For the moment, pending any comments or complaints from our readership, I will conclude with as much certainty as is needed in such an investigation that, with vital assistance from the Nova Scotia Postcard Collectors, I’ve managed to put my postcard in its proper place. And a significant place in Canadian mining and railroad history it would be, as images of such engineering feats in such remote locations so very long ago must by now be quite rare. It is well known that postcards are windows into the social life of the early 20th century, but it’s easy to neglect what they have to tell us about the worlds of commerce, finance and industry. Canada’s mining business, which was developing into its modern form around the turn of the last century, is an example — hopefully the first of several to be featured on our blog. While everyone knows about the Klondike gold rush of 1898, it is less often remembered that an equally serendipitous discovery in 1903 quickly transformed a remote corner of northeastern Ontario into the world’s largest silver producing region. 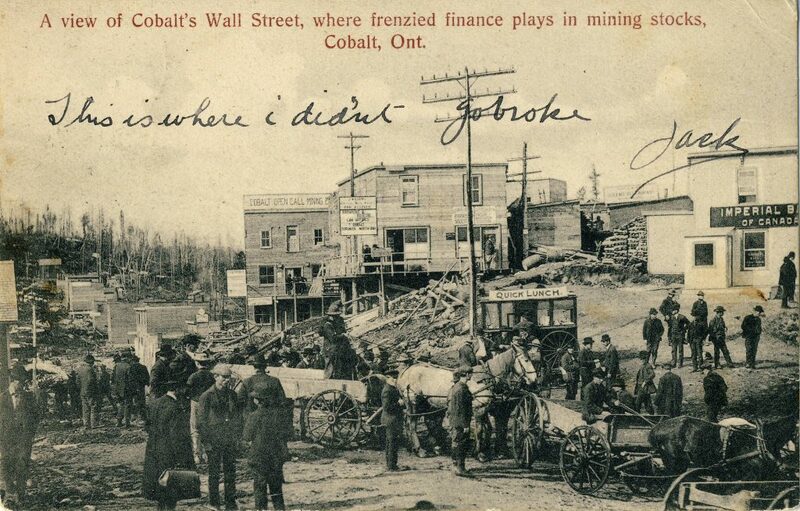 By 1908, thousands of hopeful “miners” had poured into the suddenly world-famous town of Cobalt, a few miles west of Lake Timiskaming. That Cobalt’s silver boom coincided almost exactly with the worldwide postcard craze means that there is an almost endless supply of postcard views for collectors of ephemera from this fascinating period in Canada’s history. Many of them have messages from miners, visitors and assorted hangers-on that recount personal experiences of boomtown life. Figure 1. Cobalt’s Wall Street, c. 1908 (Copp, Clark). The building at the left houses the stock market: Cobalt Open Call Mining Exchange. The building at centre is the equivalent of today’s downtown skyscraper, housing professional services firms: the assayer, the law offices of Browning & Boultbee (“Cobalt – Toronto – North Bay”) and two other law firms. To the right are the financial services offered by the Imperial Bank of Canada (one of many banks in town). In the rear, at right, is the Queen’s Restaurant, where business deals could undoubtedly be made in quiet comfort (if one had time; otherwise it was the Quick Lunch cart in the foreground — the “food court” of its day). The reality of the whole situation, for many people, is suggested by the sender’s inscription across the face of the card: “This is where I didn’t go broke”. It was undoubtedly very easy to do so if you weren’t careful. On the reverse, “Jack” engages in a bit of eye-rolling as regards a companion who was apparently a bit more “into it” than he was: “Byron is out speculating in the rain this morning on a broncho”. Of course, with modern communications, the majority of the mining finance activity that this “Wall Street” card represents would today be performed in Toronto rather than locally. But, at least in microcosm, the various functions of Bay Street (or Wall Street) are encapsulated in this image. Also shown below, as Figure 2, is a bifold (double) postcard by Warwick Bros. & Rutter of Toronto (no. 4942), posted October 8, 1908, not long before the 1909 fire that destroyed much of the town (click to enlarge). Figure 2. Cobalt, Ontario, c. 1908 (Warwick Bros. & Rutter). Error: Error validating access token: Session has expired on Friday, 12-Apr-19 20:21:58 PDT. The current time is Friday, 19-Apr-19 21:36:01 PDT.